While I may be a stickler for spending more on shoes and handbags rather than clothes, I don't have a bottomless pit of a bank account. I strike when the sales are hot, particularly if I've been eyeing on certain shoes for a season or two. 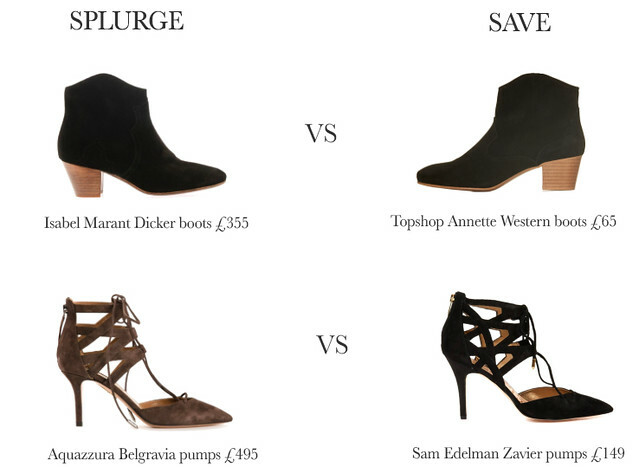 There's an alternative to the ever popular Isabel Marant Dicker boots if you prefer to pay £65 instead of £355 or a similar Aquazzura Belgravia looking pumps for a fraction of the price. Alas, the Topshop boots are completely sold out in my size (I've spent a very busy afternoon calling every Topshop store within a 200km radius. Damn and double bummer) but nab a pair quickly before they're gone. That Topshop pair are eerily similar aren't they?! I've got the Isabel Marant pair so I'm not really tempted to buy a second, although I would if I hadn't bought those on a whim last year. Of all the boots, the IM ones are the most flattering. I'm waiting for Sam Edelman to make the mid heeled Aquazzura lookalike heels. omg love those boots! xO! Similar boots also by H by Hudson...really cute and OK quality. Kristina, I saw the H by Hudson. They run big so even the smallest size doesn't fit me. You're right about the ok quality. I wasn't overly impressed. I can get similar quality for half the price.